Photo courtesy of Red River College Winnipeg. 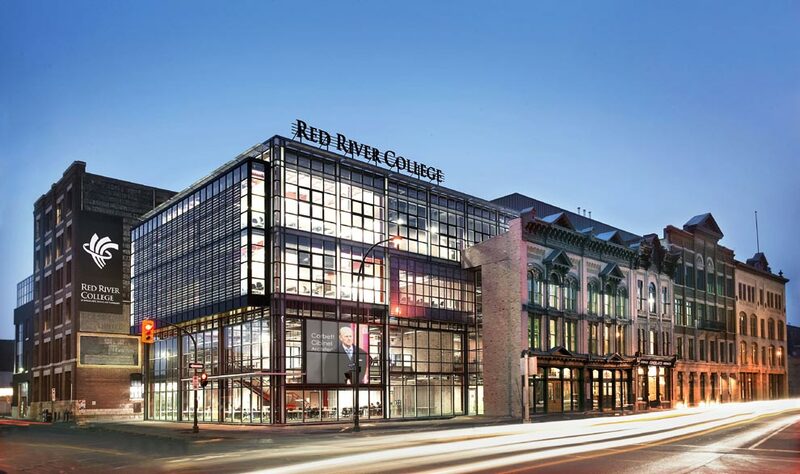 Red River College in Winnipeg has awarded a $95-million Innovation Centre project to Diamond Schmitt Architects in joint venture with Number TEN Architectural Group. The 100,000-square-foot development will comprise new construction and incorporate a repurposed downtown heritage building to provide state-of-the-art facilities that will help create jobs, expand research, and foster innovation in the heart of Winnipeg’s Exchange District. Diamond Schmitt and Number TEN were selected for their combined team experience designing flexible, collaborative educational space that can readily be adapted as learning methods evolve to keep pace with changes in the workplace. Among the features to advance student projects to marketplace development include a pitch session room and open teaching areas the College calls “collision” spaces that accommodate students working together alongside industry and social service partners. The project received $40.6 million in funding from the federal government through its post-secondary institutions strategic investment fund (SIF), which stipulates a fast-track timeline for construction. “We are now in the design stage and we expect to be building within twelve months,” said Red River College President Paul Vogt. RRC is currently in the early stages of implementing a major fundraising campaign – the largest in the history of the College – to raise the additional $54.8 million to support the development of this project. The project site is at Red River College’s Exchange District campus and will include the 100-year-old, three-storey Scott Fruit Building. An existing structure is being demolished for the new construction and building site preparations are underway.